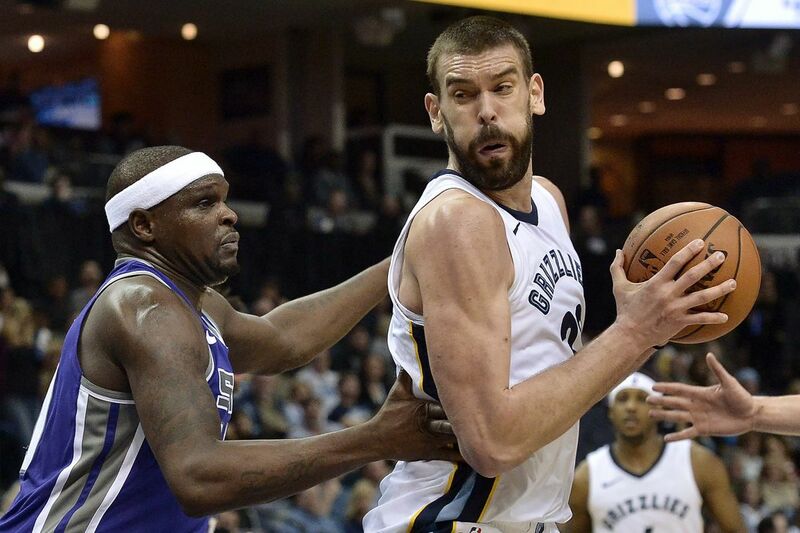 Memphis center Marc Gasol, right, controlling the ball against Sacramento forward Zach Randolph during a game Friday. In addition to keeping an eye on Marc Gasol, the Sixers must contain Chester native Tyreke Evans to snap the undermanned Grizzlies' four-game home winning streak. Evans is averaging 21.8 points and 6.9 assists over the past 13 games. This game might not a breeze for the Sixers as the Grizzlies' record might indicate. They have won seven of their last 12 games. That comes after a stretch in which they dropped 19 of 21. 9 Dario Saric PF 6-10 13.6 ppg. 6.8 rpg. 21 Joel Embiid C 7-2 24.0 ppg. 10.9 rpg. 7 Timothe Luwawu-Cabarrot SG 6-6 6.1 ppg. 1.0 apg. 25 Ben Simmons PG 6-10 16.6 ppg. 7.2 apg. 24 Dillon Brooks SF 6-6 8.4 ppg 2.9 rpg. 0 JaMychal Green PF 6-9 10.1 ppg. 7.4 rpg. 33 Marc Gasol C 7-1 18.1 ppg. 8.5 rpg. 23 Ben McLemore SG 6-5 7.0 ppg. 1.9 rpg. 12 Tyreke Evans PG 6-6 19.6 ppg. 4.9 apg. Injury report: Mario Chalmers (right shoulder, out); Mike Conley (left heel, out); James Ennis III (right calf, out); Andrew Harrison (left shoulder, out); Chandler Parsons (illness/right knee, out); Brandon Wright (illness, out). The series is tied at 21 wins apiece, but the Grizzlies have won the past nine meetings.